NINE LIVES: Riverstone Terraces resident Maxine Robb with her cat Bouffey, who she believes was poisoned by possum bait stations near her property. Behind her is the pole where moreporks once perched before GWRC installed bait stations. Veterinarian Andrew Cassells says it is “quite likely” brodifacoum poisoned the cat, but he did not test for poisoning because it was too expensive for the owners. 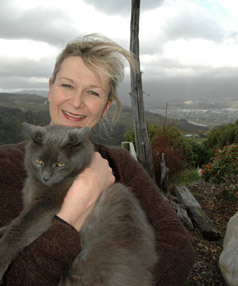 Some Upper Hutt residents claim the regional council’s possum bait is poisoning their cats and native birds, causing some to die and others to disappear. Greater Wellington regional council’s business unit BioWorks placed the poison brodifacoum in Riverstone Terraces in April to decrease pest numbers. Since then, Maidstone Veterinary Clinic has treated three poisoned cats – one of which was euthanised last month – and two poisoned dogs, all from Riverstone Terraces, a vet says. Depending on the dose, brodifacoum can kill large animals such as dogs, he says. But BioWorks contracts co-ordinator John Hopkirk says he doesn’t believe its brodifacoum is poisoning cats or native birds. However, resident Maxine Robb believes her cat, Bouffey, was poisoned by brodifacoum in April after BioWorks installed bait stations on her and her partner’s property. Within days the couple found shaking, half-dead rats within metres of their house, she says. Soon after, Bouffey started bleeding from his gums. Ms Robb took him to Maidstone Veterinary Clinic, believing he had eaten a poisoned rat. Well heres my two cents worth…..
As a young lad, I run all over Craigs Flat as it was called then (now Riverstone Terraces) and it was farm land with encroaching regenerating native bush. The area was generally used for sheep and cattle grazing. While we shouldn’t have been on farmland without permission, we loved the rabbits, possums and the wildlife and equally used it to gain access to Whakatiki Stream where we went swimming etc. The area though had huge possum numbers with sign everywhere. Time moves on, and the River Terraces as a surburban development was built there right up against this regenerating native forest, no wonder given the appeal of the location and the splendid views. But the problem was and still is Possum numbers, they are endemic. The difficulty lies in how we go about controlling them and the methods used. I’m either or on this and see the difficulty GWRC has, and well as the concern of the residents. But I have a solution, one that was on offer back 30 years ago when I roamed up there, bring back a tally for dead possum numbers paid by Regional Councils, killed humanly (no Gintraps like we used). Is it not valid employment in this recession. “It’s been a bolt from the blue,” said Matthew Flood, a resident of Mills St, Boulcott, for 37 years. Residents had not been properly consulted on a Greater Wellington regional council plan to move a stopbank east, meaning up to 12 homes would go, he said. Flood protection manager Graeme Campbell said the council needed to move the stopbank to boost its flood protection. A big flood in 1898 had prompted the building of stopbanks. The council was now considering two options. One was to move the stopbank 30 metres to the east, meaning four homes would have to be shifted. The second was to move it further, placing eight more homes in the firing line. The council hoped to confirm its plan by the end of this week, Mr Campbell said. Homes would be bought and moved, rather than bulldozed, he said. If homeowners refused to sell, land could be seized and compensation paid under the Public Works Act. Mr Flood said he had never seen the stopbank threatened by a flood. A Mills St resident of 57 years, Tse Wk, said the council’s plans were not essential and a blow to the whole street. “I’ve got no idea why they want to do it.” A simpler option would be to clear the riverbanks of rubbish and debris. The council has held two meetings with Mills St residents. Hutt River advisory subcommittee member Peter Glensor said any work was five to 10 years away. The matter came to a head when a Mills St house went up for sale two months ago and was bought by the council, Mr Glensor said.